Anyone who stumbles on my site or follows me, will know I tend to focus on single origin chocolate created by bean-to-bar producers. However, chocolate is so much more. Filled chocolates form a entire world on their own. They are produced by an abundant amount of chocolatiers, trying to capture the attention of the public. Many of these creations are mass-market oriented, overly sweet and bring the same classic tastes over and over again. How can an artisan creator stand out in such an enviroment? Especially in a country known for chocolate like Belgium? Nicolas Vanaise of Yuzu surely found a way. He is heavily inspired by Japanese tradition and culture. He owns a small shop in the heart of Ghent and when you peak through the front window, you’re thrown to the Far East in a flash. Ceramics, delicate sculptures and refined chocolate figurines breath the atmosphere of the land of the rising sun. By chance I stumbled upon an online contest created by www.kitchenroots.eu – run by Charles Wailly, a pure food addict/chef and blogger. Turned out I won the contest by explaining what real chocolate means in my life. The prize? A box of Yuzu chocolates! My anticipation couldn’t have been bigger than this. Charles personally delivered the box to my door, making this even more exceptional. The box is amazing. 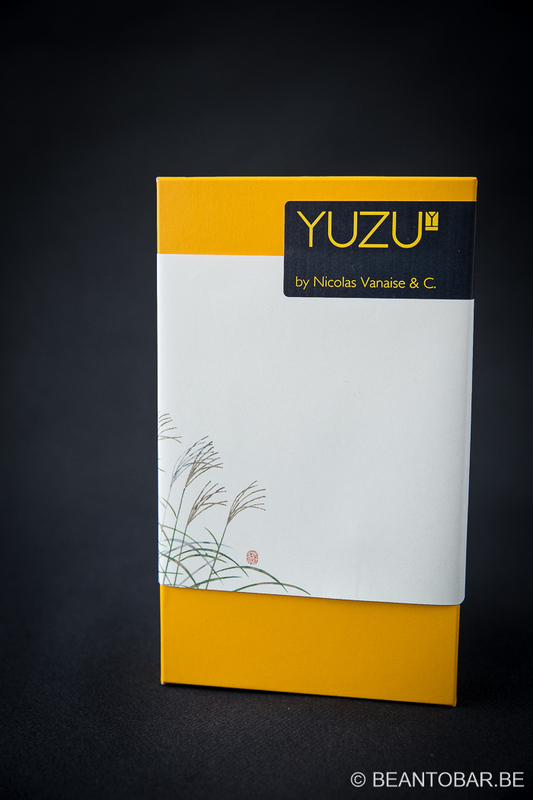 Bright yellow greets you, while minimalistic artwork and logo remind you once more about the Japanese refinement which inspires Nicolas Vanaise. Inside the view is even better. 12 carefully sculptured, rectangular chocolates greet you. Vibrant and unusual colors decorate the pieces, making you wonder about the flavors to be discovered. For a moment I was looking if there weren’t any chopsticks provided in the box. It seemed almost sacrilege to touch the chocolate with bare hands. The presentation is phenomenal. A flyers inside the box shows pictures of different chocolates with the flavors they include, though I had a hard time to connect them to the ones I found in the box, so in the end I let the chocolates speak for themselves. 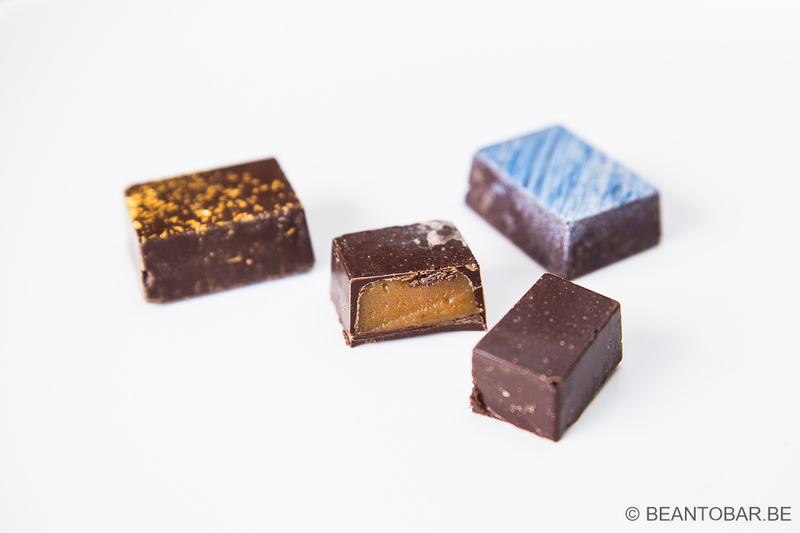 Nicolas creates ganaches based on chocolate and soy cream, a bold decision in a world where real cream still rules. Here are some impressions I noted down while tasting the chocolates. 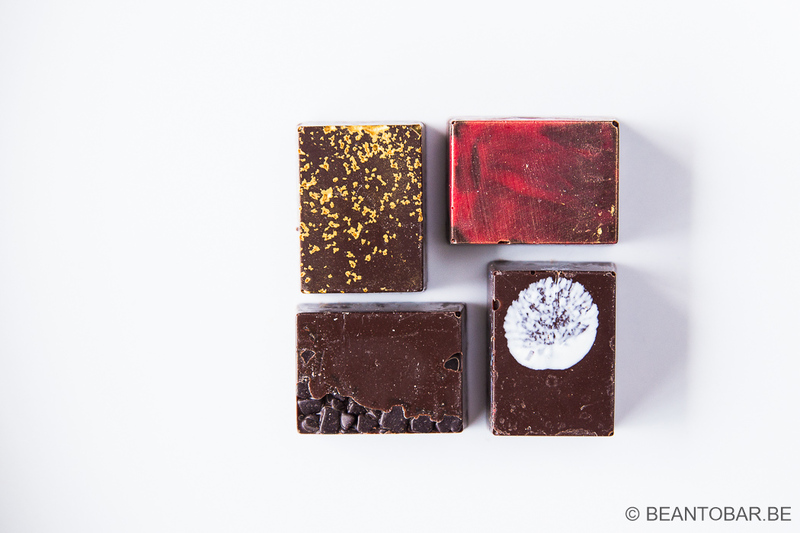 The one with the silver corner – Dark chocolate with creamy interior – fruity scent – caramel flavor + woody slightly earthy and licorice like chocolate. Light on the palate, leaves a smoky impression that fades quickly. The milk chocolate one – a ganache filling smelling of roasted nuts – nice pure hazelnut and caramel aroma with a dashes of salt and the crunch of small pieces who reveal themselves as cocoa nibs,as their earthy flavor punches through the hazelnut aroma a leaves you with a coffee/wood like aftertaste. This one has an impressive flavor changing profile! The red one – floral with a crunch of roasted rice – going from smooth milk chocolate with a tobacco touch over to a slight fruity acidity before ending with more toasted notes. The gold one – a spicy start combined with a slight burn of rum or whiskey moving over to subtle roasted flavor in the back. Fades away to soon, making you crave for more. 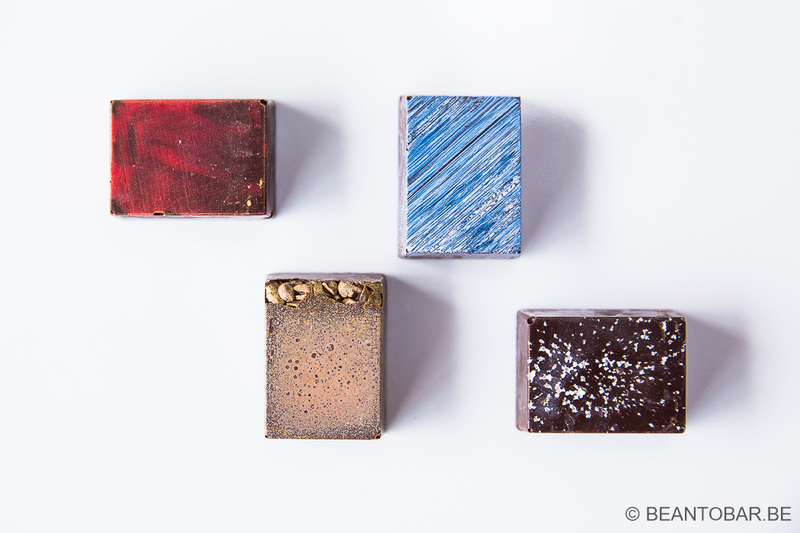 The blue one – imminent dark chocolate tones and a hint of rum, followed by what tastes of ripe bananas and toffee. The dark chocolate from the shell cuts nicely through the sweeter flavor of the filling and adds dept. The aftertaste has a slight fruity hint. The chocolate flavor remains for an extended time in the mouth. Milk chocolate with seeds one – Opens up sweet due to the milk chocolate, followed by a cloud of abundant roasted sesame seeds, before moving over to a nice rich hazelnut ganache with a slight crunch? Finally the toasted flavors vibrantly return near the end of the melt. Very flavorful and the hazelnut ganache keeps lingering in the mouth. The milk chocolate adds a really creamy effect the experience of tasting this praline. The one with gold speckles – a very strong whiskey flavor combined with a gentle, floral smokiness in the back. The dark chocolate enrobing the filling forms a sweet contrast to the inside. The filling seems to dissipate quicker than the chocolate, leaving you with more earthy flavors in the end. A masculine flavor profile. The dark one with pebbles – Very acidic opening up. Seems like a citrus fruit combined with mint. The contrast with the dark, sweet, slightly spicy chocolate is very powerful and bold. 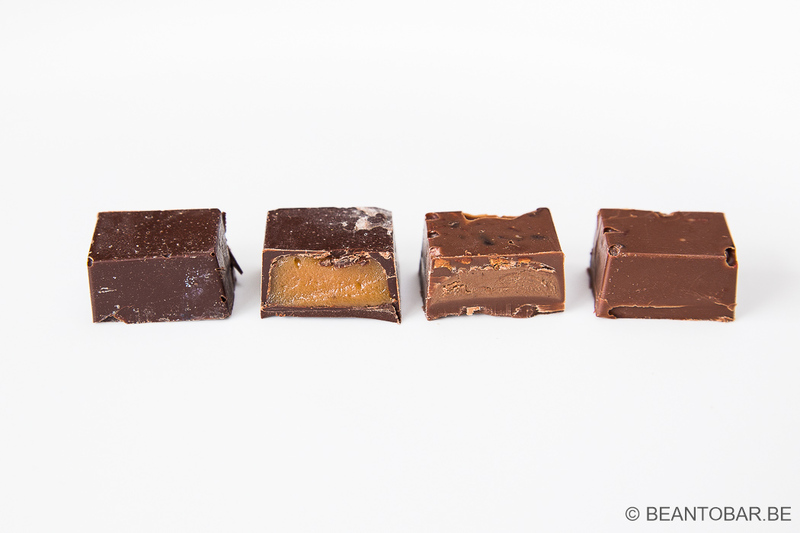 This shows how surprising a praline can be and how these contrasting flavor profiles can create an exciting product that moves far away from traditional all over sweet aromas. Nice! 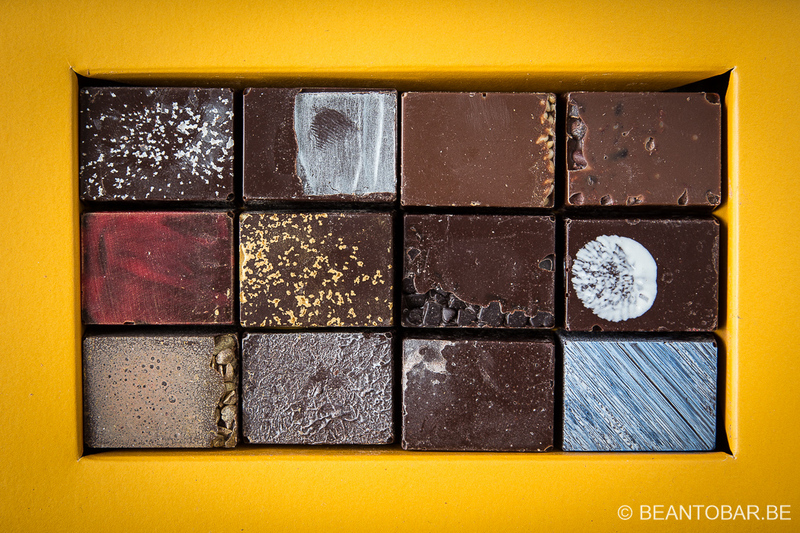 The one with the Marble spot – A fruity start, combined with a hint of licorice. The dark chocolate blends in with a subtle lime flavor that flows through the sweeter filling and rises to a climax, giving it a fresh zing. The chocolate itself adds a woody tone to the mix. I’d like it even more if the shell was made of a different chocolate as this is the final part that remains in the mouth, once the filling has molten away and the chocolate flavors don’t hang around for a long time. The one with the silver surface – Starts once more with a smooth, sweet flavor. Dark chocolate and a liquor taste combine in a great combination. Raisin and rum come to mind. Warm hearted and deep. This time the flavor of the filling persist longer in the aftertaste, making the experience even more enjoyable. While this one doesn’t evolve in flavor, it is very balanced and keeps flowing. The praline doesn’t offer wild flavor changes, but the taste is lush and makes you wonder if there is one more of these in the box. So where does this collection of wonderful chocolates leave me in the end? It certainly intrigues me to see there are passionate people out there who want to create something special and different. People who focus on flavor and want to surprise their clients with unexpected combinations. Nicolas certainly hit the spot in several chocolates. I’ll never get tired of experiencing chocolate with the ability to change flavors while melting in your mouth. Aromas that pop up and explode in your mouth, before making room for the next one. Especially when these flavors contrast with each other, but still form a harmonic end result. I call those masterpieces! Other chocolates displayed a more balanced flavor profile, where the combination of several tones form a wave of enjoyment. Especially in the alcohol infused ganaches I noticed how they never become overwhelming but add drama to the overall taste. In the end there are also chocolate that don’t inspire me much. They taste nice, but don’t bring the same excitement as some others do. In short, I love the bold flavors and how they are combined. But I can’t keep wondering what would happen if these great ganaches would be combined with true bean-to-bar chocolate enrobings, where the chocolate could actually become another player on the palate. I can only imagine the flavor fireworks! Whenever you are in Ghent or get the chance to discover the worh of Nicolas Vanaise, don’t hesitate. It’s so far above the every day chocolate you find all over the world! The optics are amazing! Different from anything else I’ve seen. What did you think of the underlying soy cream?